U.S. wants most humpback whales off endangered list. 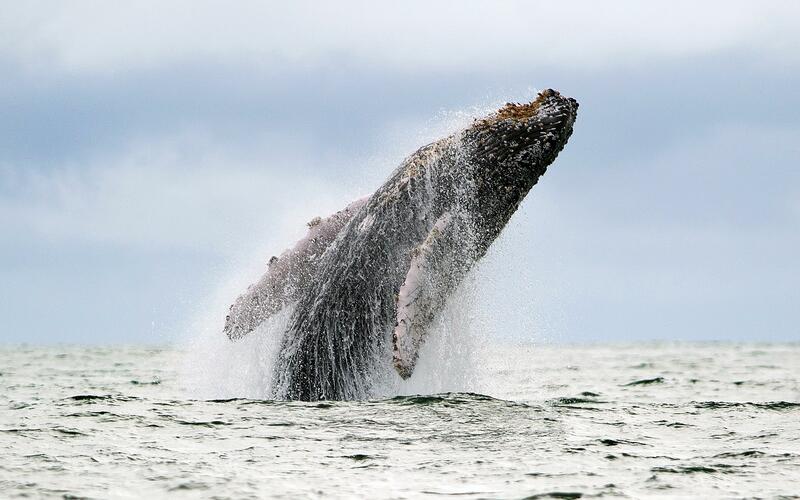 A Humpback whale jumps in the Pacific Ocean off the coast of Colombia in July 2013. The U.S. government on Monday recommended taking the humpback whale off the endangered species list 45 years after they were first listed as endangered. The change reflects the general success of conservation efforts that have helped the whale population rebound, as well as a growing understanding of the species and its existence in distinct populations that have recovered at differing rates and face distinct challenges in conservation. Protection and restoration efforts over the past 40 years have led to an increase in numbers and growth rates for humpback whales in many areas. The humpback whale is currently listed as endangered throughout its range. The proposed rule finds that ten of those 14 populations do not warrant ESA listing… Also under the proposal, two of the other four populations would be listed as endangered and the remaining two would be listed as threatened. If the proposal is finalized, the humpback whale populations that would no longer be listed under the ESA would remain protected under the Marine Mammal Protection Act… The two populations proposed as threatened – the Central America and the Western North Pacific – at times enter U.S. waters. Two other populations that do not enter U.S. waters – in the Arabian Sea and off Cape Verde Islands/Northwest Africa – would remain listed as endangered. The humpback whale was first listed as endangered in 1970 following a global ban on commercial whaling.